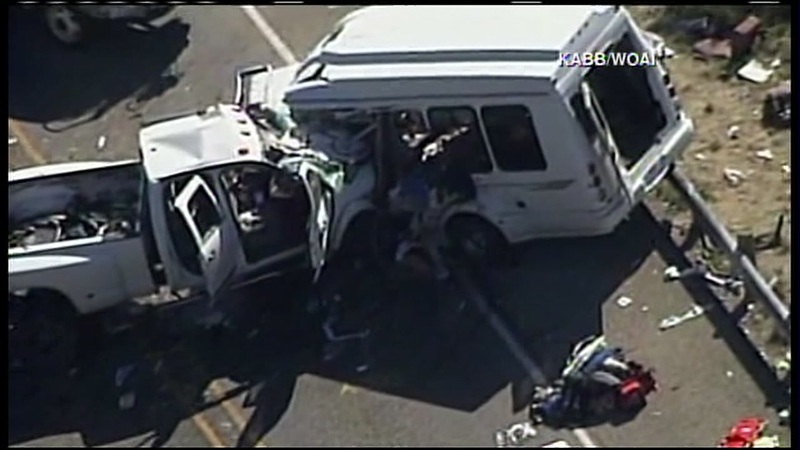 A wrongful death lawsuit has been filed on behalf of a victim in a church bus crash that killed 13 in March. UVALDE, Texas (KTRK) -- Family members have filed a wrongful death lawsuit against a motorist who was allegedly texting prior to a collision with a church bus that killed more than a dozen people. Ross Allen has filed the suit on behalf of his father, Howard Allen, who was among 13 members of the First Baptist Church in New Braunfels killed in the horrific accident. The suit names 20-year-old Jack Young, who a witness said had admitted to texting before the crash, and his father, both of whom were in the white pickup truck that slammed into the packed church bus on a two-lane road about 75 miles west of San Antonio. According to DPS, a church bus was traveling south on Highway 83 near Concan, Texas, when it was involved in a head-on collision with a Dodge pickup truck. "He said, 'I'm sorry, I'm sorry. I was texting.' I said, Son, do you know what you just did? He said, 'I'm sorry, I'm sorry,'" the witness, Jody Kuchler, told The Associated Press. The church said its members were returning from a three-day retreat at the Alto Frio Baptist Encampment in Leakey, about nine miles from the crash site. Since his father's death, Allen has dedicated his time to lobbying in support of legislation that would ban texting and driving across Texas.